The fish owned by the village of Wilson is displayed at the intersection of Young and Lake Streets. 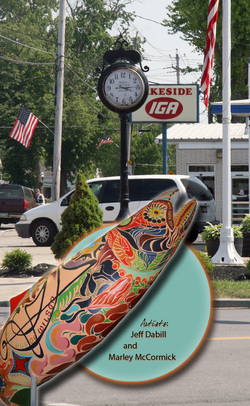 The fish has an Art Nouveau motif and was designed and painted by Wilson alumni Jeff Dabill and Marley McCormick. Originally settled in 1810 by Reuben Wilson, the village of Wilson was incorporated on May 11, 1858. The little settlement was ideally located where the Tuscarora River, (Twelve Mile Creek) joins Lake Ontario. As an official port of entry from 1851 to 1907, the village became an important asset to the growth and development of Niagara County. In the second half of the 19th century, the village became known as a booming resort town, known for its fine hotels, boating, fishing and other recreational activities. Today, the officials serving the village include: Patrick Kelahan (mayor); Bernie Leiker Jr. (trustee); James O’Donnell (trustee); Ellen Hibbard (clerk-treasurer); Ann Stimm (deputy clerk-treasurer); and Keith Dixon (superintendent of public works). Cultural assets of the village include the Wilson Free Library and the Wilson Historical Society Museum complex. The village of Wilson now offers free Wi Fi connectivity on Young Street. For more information about the village of Wilson, please visit: www.villageofwilson.org .